I do hope you'll enjoy my patterns, which are linked below. Thanks for visiting, and thanks for your interest! These crocheted baby blankets are all made with tender loving care! Striped Baby Blanket Pattern: Pictured at bottom left. This baby blanket is crocheted in lacy interrupted v stitch, and it's topped off with a pretty edging worked in vs and picots. Fast, Easy Baby Blanket for Beginners: (not pictured.) 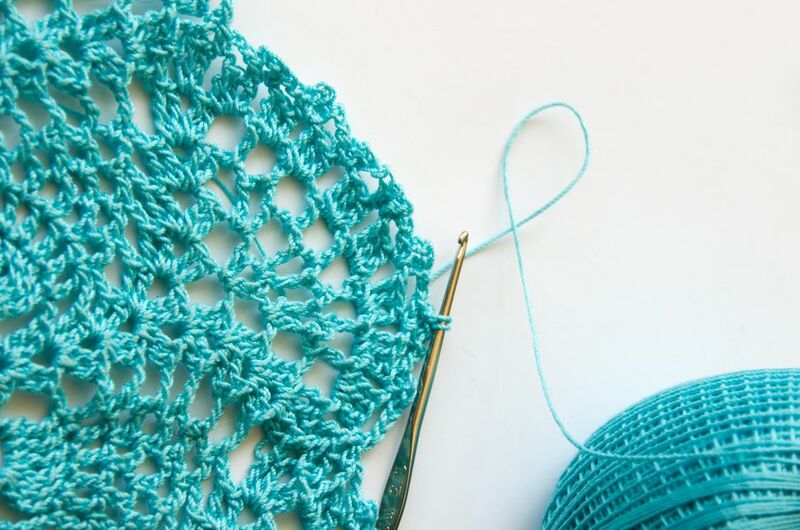 This baby blanket is one of the most popular free crochet projects on our website. It's beginner-friendly, attractive, unisex, and it works up fast. Coral Heart Patchwork Baby Afghan: Pictured at top right. This is a simpler colorway of the heart sampler baby afghan linked above. My project sample is crocheted in "girly" colors - peach, pink and yellow; at first glance, the overall effect reads "coral," hence the name. If the new parents aren't crazy about pastels, I think this is a nice alternative for a baby girl's colorway. Of course, you can change the colors on this; it's an easy design to re-color, so feel free to explore other options. Gingham Check Baby Blanket: If you're interested in learning how to do tapestry crochet, this pattern is one of the easiest possible patterns to learn and practice on. It's a predictable pattern that you don't have to think too hard about. 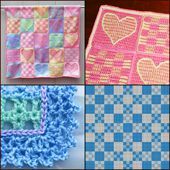 Nested Checkerboard Baby Blankets: Pictured at bottom right. Each of these blankets is constructed out of afghan squares. These patterns incorporate checkerboard designs nested within larger checkerboard patterns; they are interesting to crochet, and visually interesting to look at. I designed these patterns specifically with baby boys in mind; I crocheted my project samples in blue and white baby yarns. However, this is really a great unisex pattern that would also work well for baby girls; if you aren't sure of the baby's gender beforehand, a blanket made from these patterns in greens or neutrals would be a safe choice. Easy Baby Afghan Square: This baby afghan square is worked in single crochet. It's such a simple pattern to crochet, but the results are lovely. This is another fantastic unisex pattern; it'll work great for baby boys or baby girls, and, for that matter, you could customize it for people of any age. I've also posted a tutorial for the traditional crocheted granny square design; I cannot take credit for designing this; it's a vintage pattern that my great aunt taught me when I was a child. I did, however, take photos of each step in the process of crocheting the granny square, so hopefully you'll be able to see exactly how it's done. I take great satisfaction in designing and crocheting squares. Each square is its own delightful microcosm of interesting stitches and colors; but when you start taking the individual squares and combining them with others, the process opens up a world of fascinating design possibilities. I have more fun with crocheted squares than I used to have when playing with building blocks as a child, although the creative process in either case is similar. You could take a pile of building blocks and build anything with them, and it's the same with crocheted squares; you could turn them into bedspreads, afghans, pillows, linens, clothing, wall hangings, tablecloths, or other projects. Custom crochet afghan pattern -- pictured at upper left. This afghan is comprised of crocheted squares, all of which are part of my series of mix and match afghan squares. Trims, borders and edgings work wonderfully for finishing off various craft projects. I use them on bunches of different creations, not limited to my crochet projects. They're handy for finishing off knitting and paper crafts projects too. Crocheted Hats Designed by Amy Solovay. Crocheted Hats Designed by Amy Solovay. Photos © Michael Solovay. When it comes to hats, I'm pretty demanding. I like them to be comfortable, wearable, and stylish, but at the same time I also want the style to be classic enough that it won't be outdated before I even have a chance to finish crocheting the hat. On top of that, I like for the design to be versatile enough for me to wear it with a good part of my wardrobe - a tall order, but one that's not impossible. With all that in mind, here are the hat patterns I've designed. I hope you'll enjoy them. Lacy v-stitch hat - Pictured at top left; see more hat photos in this image gallery. The image gallery features large images of the front, back and sides of the hat. Lacy v-stitch hat with brim - Pictured at lower left; more hat pictures are also available for this design, if you'd like to get a better idea of what the project looks like before you crochet it. Simple crochet beanie hat -- Pictured at top right. This simple beanie looks great when crocheted in variegated yarn, as pictured; it also looks fantastic when crocheted in solid colors of yarn. See more pictures of the hat, and the other coordinating accessories in the set, in the simple accessories photo gallery. Freeform knit and crochet hat -- There's no actual pattern for this hat, since it was a freeform project. However, I've posted plenty of insights about how to make this type of hat. Men's winter hat - pictured in the scarves section above. This hat coordinates with a scarf which is also linked in the scarf section of this page. Team spirit hat - not pictured - I designed this hat with sports fans in mind. If you have a favorite sports team, you can cheer the team on by wearing a hat specially made in the team's colors. And if you could care less about team sports, that's fine too; just crochet the hat using two of your favorite colors, or two colors that match the jacket you wear most often. When it comes to jewelry making, crochet might not be the first technique you'd think of; but if you put your mind to it, you can crochet some truly exquisite jewelry. Beaded necklace with dichroic glass pendant -- If you'd like to see additional work-in-progress pictures or more detailed instructions, be sure to check out the beaded crochet necklace tutorial too. Checkered crochet pouch pattern -- This pouch can be lined, or not, whichever you prefer. If you want to give it a lining, be sure to check out the instructions for sewing the lining too. Pretty little "extras" are one of my great delights as a crafter and artisan. I find it so much easier to be creative with my pattern designs when I have a wide variety of flowers, appliques, motifs, and shapes on hand to draw from. Here's a list of my free patterns for motifs and shapes. I hope you'll think of all kinds of amazing ways to use them. See "Christmas patterns" section below for snowflake motifs. My free Christmas patterns are pretty basic; I'm not too excited about making things that can only be used for one month out of the year, and my crochet designs reflect that. I tend to stick with general wintery motifs like snowflakes and snowmen, which can be used long after the Christmas holiday has passed. I love using color combinations suggestive of Christmas - red and green, red and white, red white and green, red and gold, red and silver...that way, even people who don't celebrate Christmas can use these patterns; it's easy to recolor these designs and make them look totally different. Washing the dishes = bleah. Having pretty dishcloths = HOORAY! I hope these fun dishcloth designs will bring a little bit of joy to a task that is probably not the most enjoyable part of your day. Some of the dishcloths linked above would also make good washcloths. I enjoy crocheting potholders for several reasons - mostly because they give me a fantastic excuse to run riot with crazy color combinations that I would never, in a zillion years, want to try out in a wearable project. Sometimes my potholders turn out well and sometimes they don't, but it's always fun to test out new color combinations. Even better, potholders are inexpensive projects; they're quick to crochet, and they are endlessly useful to have around. I never have any problem finding someone to give them to, or some way to make use of them, once they are finished. Thank you for visiting, and thanks for your interest in our patterns!